This memorial is finely carved from what appears to be mahogany in the form of a triptych with two soldiers resting on their arms (rifles) reversed in the posture of mourning in the outer panels and an inscription in the centre panel. 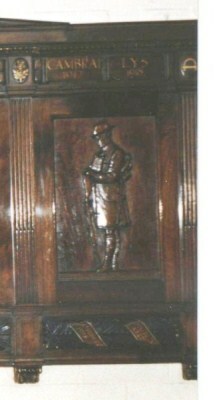 Similar figures appear on the bronze memorial which was at the Regimental HQ in Fraser Street and subsequently moved to Forbes House in 1967. It is likely, therefore, that the designer for this memorial was also H. Tyson Smith especially in the light of the stylistic similarities of the lettering adn the pediment. The inscription is given below. Immediately below the pediment are the divisional badges of those divisions with which The Liverpool Scottish was associated. 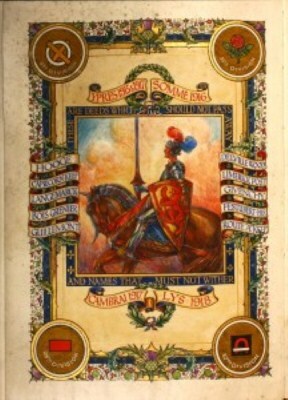 These are also seen in the painted frontispiece of the Roll of Honour. St Andrew's and The Liverpool Scottish. 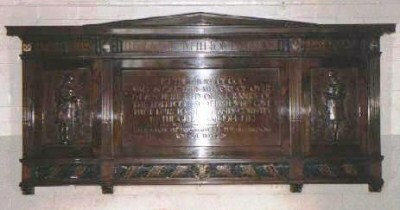 The memorial was offered to V (The Liverpool Scottish) Company in the 1970s when St. Andrew's closed its building in Rodney Street (now with the only shell facade of the church preserved). The Liverpool Scottish held their Remembrance Sunday Service at St. Andrew's until it closed, marching from Fraser Street with the Colours to the church even after the barracks there had closed. In subsequent years, a service was held at Forbes House and then the soldiers of V (The Liverpool Scottish) Company (including those who had taken part in the Liverpool Garrison service at St George's Hall) moved to Rodney Street with the Old Comrades, the Liverpool Scottish cadet units and the Liverpool Scottish Pipes and Drums to form up outside the church. From there, they marched down into Liverpool city centre, where the salute was taken in Lime Street in front of St. George's Hall, and then into St John's Gardens behind the Hall. In later years, a small ceremony has taken place in St John's Gardens at The King's Liverpool Regiment memorial and the Liverpool Scottish Stone of Remembrance following the Liverpool Scottish participation in the service at St George's Plateau. "To the glory of God and in grateful memory of over eleven hundred of all ranks of The Liverpool Scottish who gave their lives for King and Country in the Great War 1914 - 1919"
"Their names are inscribed in the Regimental Roll of Honour"